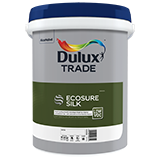 Dulux Trade Ecosure Silk is is product with a good quality mid-sheen finish that has a reduced environmental impact. Hard wearing and good exterior durability. Low dirt pick-up due to smooth mid-sheen finish.